All the features provided by the product Tivoli are very useful for any organization as Tivoli and its component products provide every feature of Identity Management concept, but it totally depends on the requirement of the project. And I think, the most important feature of Tivoli is "Custom Adapter Development" which allows to create agents for almost every application, so that Tivoli can communicate with those applications. HR - to store the identity and process it accordingly for salary, bonuses and all other financial and HR related work. Active Directory:- to allow the user to log into the system and managing the user under various access levels. Tivoli - create the user's ID in Tivoli and allow the user to pass through various workflows for different access on different resources in the organization and then managing their passwords on different applications. After Tivoli has been implemented all these processes can be combined into ONE and become automated, i.e. we have integrated Tivoli with HR products and with Active Directory. So, as soon as HR enters the new user's information in the HR product, Tivoli picks the information from there and automatically creates the account in Tivoli as per the information received from HR. Tivoli then creates the account in Active Directory without manual intervention and in real-time. Also, the password management also becomes centralized. 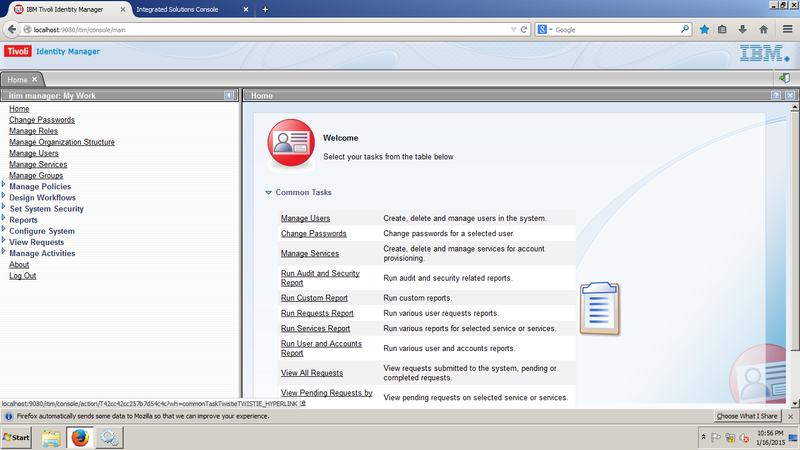 IBM can work on providing better options for creating custom reports, although various supporting IBM products are available. However, if the functionality is provided in the Tivoli product, then the options should be there for creating Expected Report formats. It's highly dependent on the database connection, if there would be even a slight network glitch in the connection between Tivoli and, mostly DB2, databases and the system was not able to recover and re-establish the connection, it would require a complete environment restart. I have been using Tivoli for about three years. I have been working on different versions of the product and even worked on a migration and upgrade project. I have faced several issues while deploying it, but all were solvable either by myself or with some help. The documentation provided by the IBM for issues and deployment are very good and it is easily and freely available. You will able to get very near to the solution, if not all of it, with the help provided in the documents. I haven't seen any issues with the stability mostly, but as compared to Linux OS you may find glitches and some instability on Windows OS. Sometimes, Windows servers show unexpected behavior which results in an unstable environment and would require a restart. If, as per the requirements, supported hardware is provided, we have never found any issue with scalability. Customer services provided by IBM is the BEST. Timely provision of the best possible solution, very polite, knowledgeable and experienced support staff. I have worked with other vendors too, but IBM is the BEST in this criteria. I would rate them as 9/10, as I have always had resolutions and support in the best possible way. Timing for providing the resolution depends upon the priority of the ticket, but the IBM support team gets in touch until the issue is completely resolved. They provide timely updates on the issue with various suggestions, and, if possible, I can still expect more from IBM, so NOT 10. I had previously been working on different identity management product from a different vendor. I got the opportunity in one of the projects that was using the IBM product and as the suggestions from my senior management regarding the future scope and the market value of IBM's product, I took the opportunity. Initial setup of the product is straightforward if we are deploying it in "Single Server Environment." It is bit tricky in the case of a "Clustered Environment". It become complex if we configure Tivoli components like ITDS and DB2 in high-availability. We have implemented the product on our own, with no involvement of the vendor, except their technical support forproduct related issues. Implementation, migration, upgrade and swap over was successful. No, it was a migration and upgrade of the product, and our client was ready to implement Tivoli, so we have to use the same product with the latest version. Tivoli is one of the best available products in the market of Identity Management, implementation and management is quite straight-forward. It has very good Technical Support provided by IBM. So, I would advise to go for Tivoli. IBM Tivoli Directory Integrator is a tool which works with Tivoli and can be use to fetch data from resources, push data to resources etc. It is capable of performing many functions in Tivoli and can do much more. Download our free User Provisioning Software Report and find out what your peers are saying about IBM, Oracle, SailPoint, and more!